I've been very busy this week and could not find the time to update my blog! So when I happened to chance upon these photos in my laptop, I thought I would just do a quick post today on my dinner at Duck King Restaurant in Jaya One, PJ. Please do not ask me when I had this dinner. It could be in March this year. Or was it January? Heck, it could even be some time last year. I honestly could not remember! Haha! Anyway, I guess all you care about is the pictures of the food right? I went to this restaurant with a friend and these were what we ate. First off, the Roast Duck. Nice crispy skin and tender meat with a thin layer of fat in between. Simply delicious! Truth be told, before this, I didn't really like duck meat. I felt they were hard to chew and the meat was not as tender as chicken meat. But this roast duck completely changed my opinion about duck meat! Next, we ate Roasted BBQ Pork. Cholesterol laden and bad for health, but totally delicious! Now since I have never eaten China's famous Peking Duck before, I grabbed the opportunity to eat the Peking Duck here! 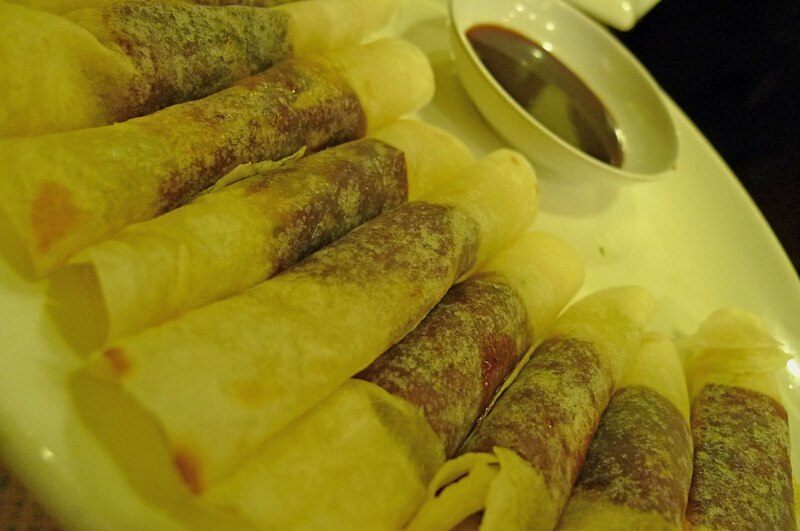 It is actually duck skin dipped in sweet sauce and wrapped in a thin piece of flour. I was not sure what to make out of this, but I thought it was quite OK. Is the duck skin supposed to be crispy? But how could it be crispy if it was dipped in sweet sauce? Well, if I ever have the chance to eat this Peking Duck in China, I will be able to make a comparison. All meat and no vegetables were bad, so we had this kai lan dish! 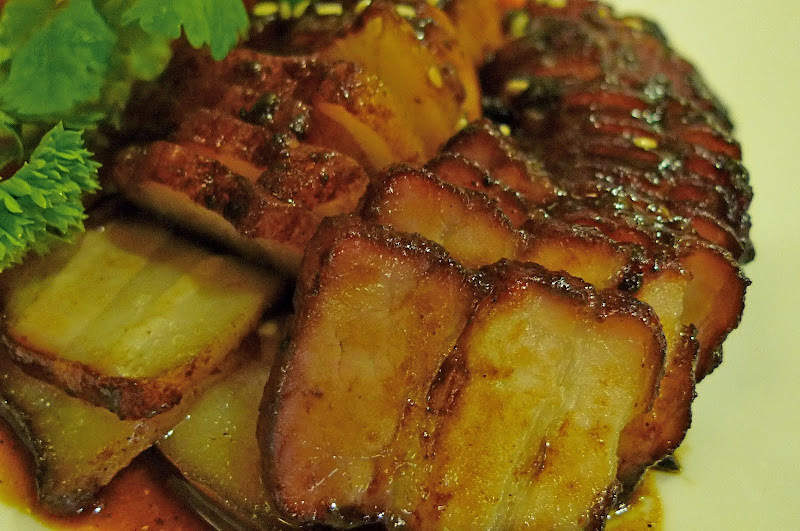 It was called 2-style Kai lan because it was cooked in 2 different ways! The one on the left is kai lan leaves being fried to a crisp. Whereas the one on the right is kai lan stems prepared the normal way, that is lightly stir fried in garlic. I like both styles! But I guess the lightly stir fried kai lan on the right is the more healthier of the two. Now, what do you think these are? 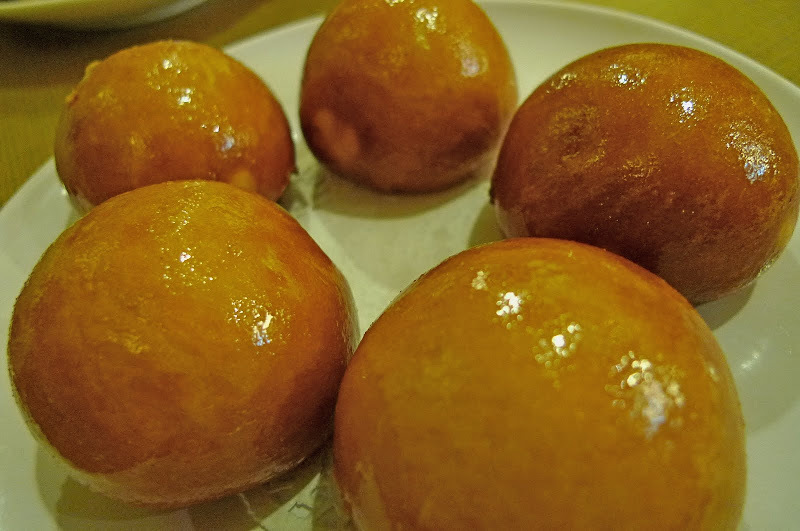 They are actually minced duck meat stuffed in deep fried mantou (or Chinese steamed bun). Goodness! I really, really love these mantous! If I ever go to this restaurant, I will definitely order this dish again! 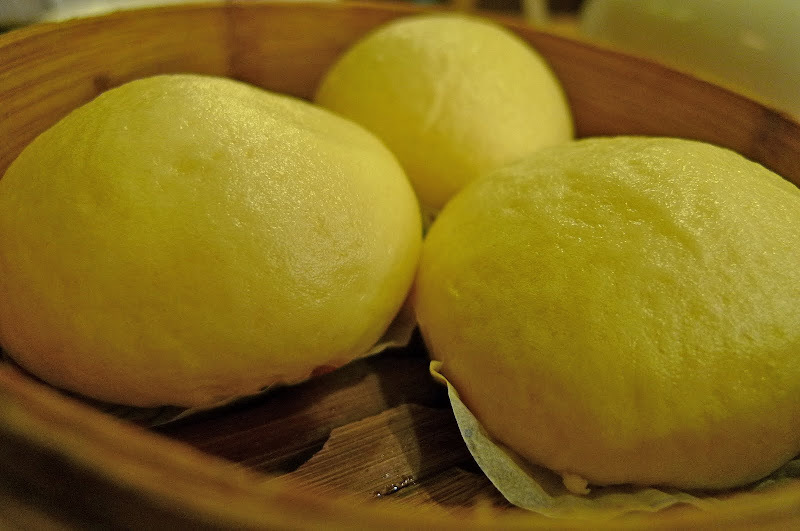 Lastly before we end the dinner, we ordered this very famous dim sum - the Golden Sand Bao. I am not sure why it is called Golden Sand but maybe it had something to do with the milky sweet custard that oozes out when you bite into the bao! Oh my God! This one was totally yummylicious! One bite and I was on gastronomic heaven! I am sorry I could not provide you with the prices of each dish. As I said earlier, I had this dinner quite some time back and at that time, I did not bother to note down the prices. But one thing's for sure - please do not expect it to be cheap or even reasonable. It's most likely on the high side. Oh well, this must be a pretty bad review right? But really, I am not trying to write a review here so everything's good. Haha! But if you have never been to this restaurant and want to go there, here's the address. i like duck meat! but seldom eat it cz parents dnt allow eat it regularly. LOL! the duck skin one look so tempting! drrol!!! Omg the duck looks good! I have not have such duck for a really long time now. The dessert pao looks good! 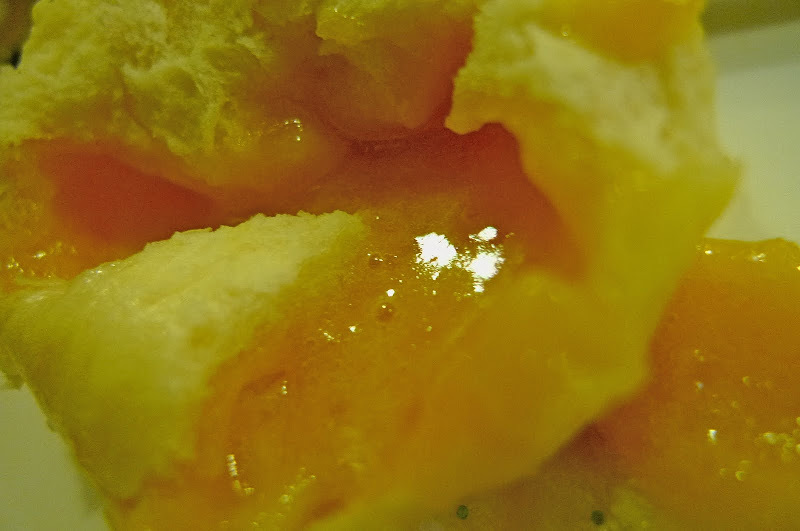 Egg yolk custard?! Oh my... yum... I remember Dragon-I's one was also good. wow..this is unique!! how come ipoh doesnt have a shop like this.. those mantau-s are super seductive! hahaha,. The golden sand pau is actually salted egg issit? Very creamy type. The fried man tou with duck meat fillings is something special. I think Puchong also got 1 Duck King branch. Maybe next time can go and try. Minced duck meat? that's something new to me. Wish you have the 'bite-already' version. I wanna see how it looks like inside. Jaya One...I have been there before. :) But well...never eat anything there. Hahaha :D So long already huh! I also have photos and posts awaiting for em to post them up. It all boils down to how we cook the duck meat right? And of course the handling and the freshness of the duck is also very paramount. i've never been there before leh.. but OMG, the food look very very very delicious!! The kailan dish looks yummy. 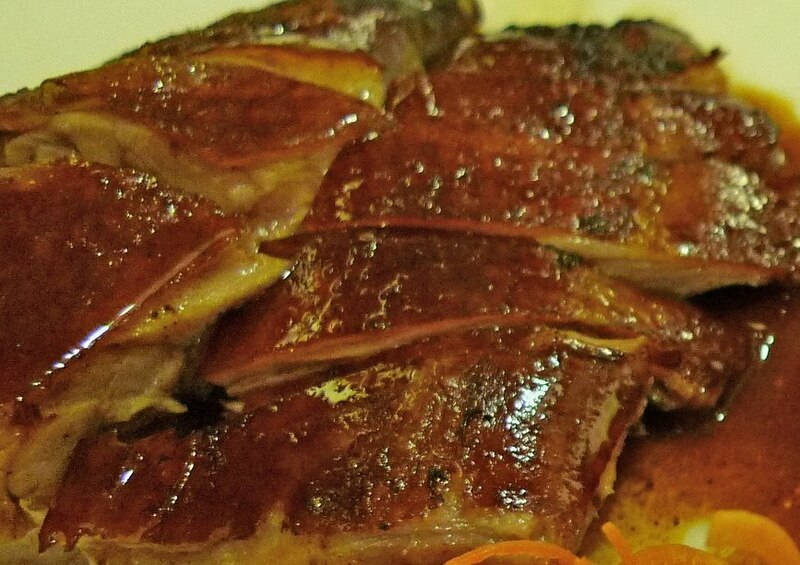 That Peking duck dish is only one part of what can be made from Peking duck. If you dine or order a Peking duck, say in a Chinese restaurant in a 5-star hotel, the duck will be carved in front of you and served in three stages. It's quite an experience. it happens to me once. I blogged bout Fireman in Curve.. the week after, they closed down @_@ lol.. The one thing I noticed about the place was the duck on the sign outside kinda looks like it's flipping people off. Seriously. Ohhh I want the minced duck meat stuffed in deep fried mantou! It looks GORGEOUS! When are we going to eat at Duck King?? I love Peking duck. One of my fav dishes. Love the one served by Duck King. This place was packed with customers when first open....didn't manage to eat there! LOL! This Duck King is always full house! Some bloggers complained it is pricey but if the menu is good, who cares! I agree that 'bao' is yummilicious! The colour looks good!!!!!! You took the photo in January, then the food is grossly EXPIRED!!!!!!! What is the next expired photo you wanna share? Quick FoongPC! Wow very beautiful collection all is very important thanks for it. caroline, yes the duck meat is nice!! 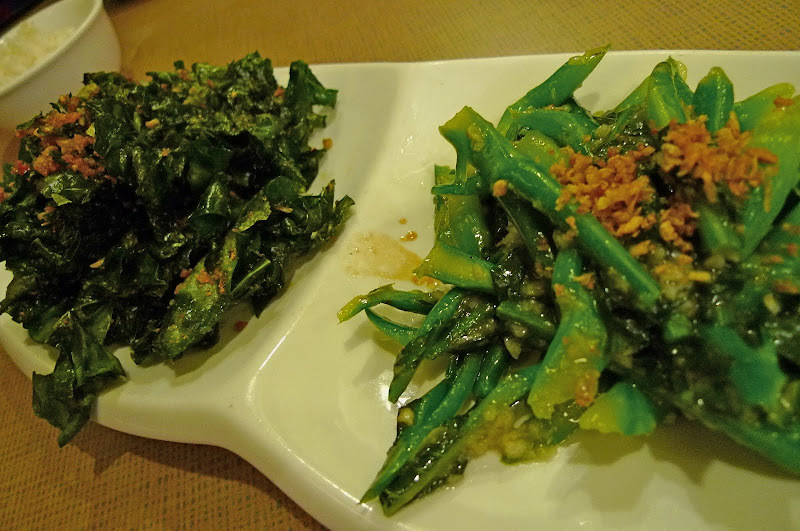 The kailan looked different cos one was fried till crispy while the other was lightly stir fried. I was at a Duck King Restaurant in Bandung, Indonesia last week. Wonder if they are the same management? But I do love kailan.. belacan or with ikan masin, oh my! Ok back to slaving away in da kitchen, see ya tonite! u should really try the peking duck in china, makes u wanna go back again and again. wah, it really looks good la. burnt a hole in your pocket? Nice foody items! have a great day ahead. what a delightful spread, happy weekend. The dinner party was really a mega event for all of you. The restaurant looks to be well decorated with the foods looking to be too yummy. Duck King- the name itself is so interesting that one would definitely stop by this restaurant to get an insight into the menu of this restaurant. The dishes are really yummy in look.